If you live in San Francisco or have visited the city, you may have seen my art. Under the pseudonym "fnnch," I create street art and murals not only to brighten the lives of our residents and visitors, but to engage the 95% of people who do not visit our art museums and to induce them to think differently about public space. Public space is our space, and there should be ways to use it for surprise, delight, dialogue, and self-expression. 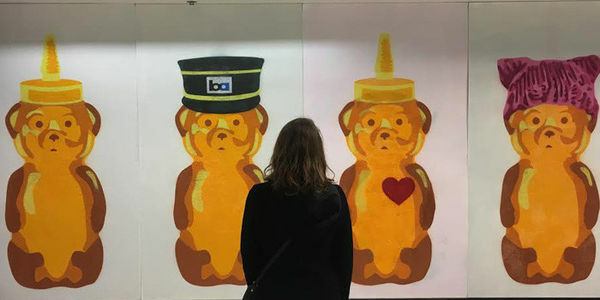 But two common ways of creating temporary public art — stickers and wheatpaste, which are more tolerated in California generally and in the rest of the world — are criminalized in San Francisco. Please sign my petition if you would like to see San Francisco decriminalize street art stickers and wheatpaste and reduce them from misdemeanors to infractions. I am not asking to make putting stickers up legal; I just want to see the city take an intelligent first step. Eventually, I would like to see the city experiment with full legalization in certain places, and I suspect this could be cheaper than what we are doing now, which is patrolling every pole and peeling, scraping, or painting over stickers on a daily basis. A sticker might not seem like much, but there is a whole world of sticker art. People draw or paint onto stickers and then put them up on signs, poles, windows, and other places. While some of this is advertising, a lot of it is art. And it is a special kind of art. Stickering is an art form that is accessible to any individual regardless of age, technical ability, or socioeconomic status. Not everyone has the technical skills to paint a mural, and not everyone has the ability to get permission to paint a mural, but anyone can take a pen or sharpie to a sticker and express themselves. Not only can stickers be made by anyone, but they are also for everyone, again regardless of age, education, or socioeconomic status. High art institutions like galleries and museums are wonderful, but they only service a small percentage of the population. Galleries often close at 5 pm, which prevents a typical working individual from visiting, and museums charge high fees that are not accessible to every individual. By my calculations, only about 5% of our residents and visitors went to an art museum last year. Street art and murals are art for the other 95%. San Francisco is a city in which the high cost of living is forcing artists to move elsewhere. San Francisco is a city in which it is incredibly difficult to create legal art for the public. San Francisco is a city with an incredible amount of advertisements. San Francisco is a city in which residents walk around staring at their phones and not looking around at their environment. Wouldn't it be great if the city featured more art? So please sign my petition if you would like to see San Francisco decriminalize street art stickers and wheat-paste. Ask the city to support the work of artists who enhance our public space and bring joy to locals and visitors alike.